Preschool Philosophies: How is Montessori Different from Reggio Emilia? Montessori and Reggio Emilia are two educational philosophies that are similar in their approach but differ in certain key areas of their methodology. Both were developed in the early 20th century as alternate educational systems to traditional state-run systems and mostly follow a child-centric concept that encourages natural learning methods and focuses on fostering creativity, independence, social skills and resourcefulness in children. Founded by a physician and educator, Dr Maria Montessori, the Montessori methodology, also has its origins in Italy. The first Montessori school was opened by Dr Montessori in 1907 in the outskirts of Rome for the underprivileged children from the slums of San Lorenzo. Following the success of the system, it was widely adopted across the globe and is now one of the most popular educational systems worldwide. The Reggio Emilia system was born in 1945 in a small war-torn town in the Emilia- Romagna region of Northern Italy. The methodology was developed by a school teacher, Loris Malaguzzi and the local residents in an effort to brighten the lives of the children born into the war and to create a new educational system that would help craft responsible, respectful citizens. The system does not follow a defined curriculum but encourages children to pursue their own projects using materials from nature. As the major focus of the system was to initially create an enriching environment for the children of the war, a lot of emphasis was laid on the art and beauty of the classroom – which still remains one of the core areas of the system. After operating successfully in Italy for a few decades, the Reggio Emilia system started gaining in popularity in other parts of the world following a worldwide exhibition of the Reggio children’s art in 1987. The system is now being widely adopted by educators across the globe and is featured in the educational methodology of ultra-elite private schools, as pointed out by The Atlantic. Let’s now take a look at the fundamental differences between both the systems. Key Focus Play is considered the child’s ‘work’. Although the system focuses on academics, it encourages children to learn naturally through play and develop independence and self-sufficiency by making personal choices. Follows a project-based approach depending on each child’s interests. If a child is interested in a specific topic, say, farm animals, the teacher will initiate projects based on farm animals and organise activities based on that theme. The focus will shift to another subject in a few weeks’ or months’ time depending on the interest of the child. Role of the Teacher The teacher is considered an unobtrusive director, a guide who observes children without interfering in their work. The teacher is considered to be a co-learner. The teacher plans the learning journey with the child, shares ideas, documents it and communicates it with the parents and the children. The parents are also considered as partners throughout the educational process. Classroom Structured with focus on order and cleanliness. Has specific activity areas, child-sized furniture, group stations and special toys within the classroom to allow children to learn and develop at their own pace. Focus on aesthetics in parallel with function. Generally warm, inviting and aesthetically pleasing classrooms with plenty of light and well-defined spaces and display of the children’s artwork. Designed to encourage curiosity and allow the children to learn from their environment. Curriculum Academic subjects such as maths, science, language, cultural studies, geography, music etc. No defined curriculum. 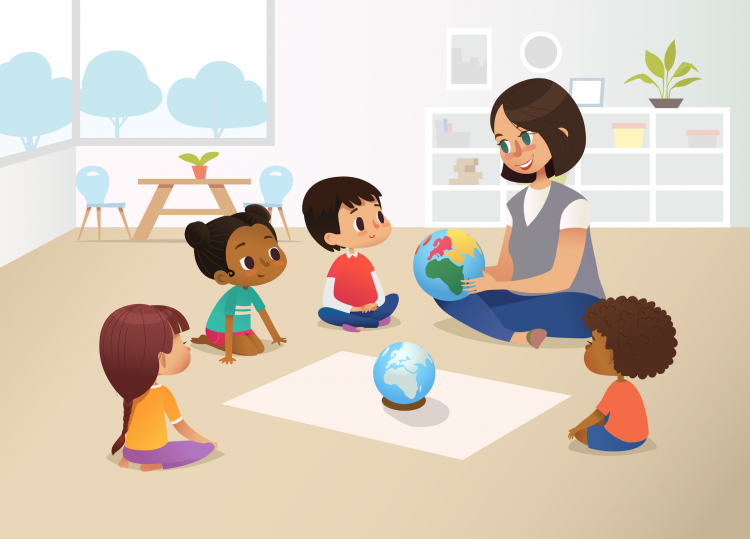 Grouping Multi-age classrooms (For instance, 3-6-year-olds in one class) to develop peer relationships and encourage learning and interaction between age groups. Traditional grouping based on age. Design Universal design. The system was developed by Dr Montessori on the belief that children across the world learn the same way, allowing the original methodology to be implemented effectively in any part of the world. The system is built on the concept that children are products of their culture. Hence the Reggio training received in one geographical location might not work in another and would need to be adapted by the teacher to fit the regional culture. Although some preschools prefer to build their foundation on any one of the philosophies, there are many who combine various approaches and create their original approach. What is the educational philosophy you follow for your preschool?